Meet your lecturers, find out more about the course and view academic and social facilities at an Open Event. Four and a half to seven years part-time. 120 UCAS tariff points (or above), BBB (A-Level), DDM (129) (BTEC), including A-level (or equivalent) subjects in Sociology, Law or Psychology based subjects are preferred, although not essential. Please see entry requirements below. Our new teaching partnership offers more opportunities for practice. Tutors bring a wealth of experience and up-to-date knowledge. The high rate of graduate employment reflects our excellent standards. Exceptional course content prepares you personally and professionally for your social work career. Benefit from our strong links to the public, private and voluntary sectors. This is a very exciting time to study for your degree in Social Work with us. We have recently launched a new teaching partnership with Norfolk and Suffolk County Councils and the University of East Anglia. The initiative will enhance the quality of your studies, bringing innovative approaches to learning, as well as even more opportunities for practical experience. This fantastic project will help raise your practice to an excellent standard, giving you the resources and skills needed for a demanding career in the public, private and voluntary social care sectors. Our rigorous approach to learning and placements ensure you become a critical, analytical and reflective thinker. When you graduate you will have the skills and knowledge to help enable positive changes for vulnerable people and families. Regulated by the Health and Care Professions Council (HCPC), social work offers a wealth of stimulating possibilities. We constantly update the course contents to reflect the changing and diverse opportunities in this field, and to give you the tools for your ongoing professional development. The tutors bring a diversity of work experience to the course, and their direct links to current practice ensures your learning is completely up to date. What is more, during your degree the teaching team provides academic guidance and careers support. All of this advances your employability in time for graduation. In March 2017 Sharon Shoesmith gave a talk to students and professionals entitled: 'Social Work in the Age of Social Media and Posttruth'. Your course – approved by the HCPC – is designed to meet Quality Assurance Benchmark Statements for Social Work, and incorporates The Professional Capabilities Framework. In fact, when you apply, we will ask you to provide evidence that you understand the Framework. Once your degree is completed, you are eligible to apply to the HCPC register, allowing you to begin your social work career, subject to meeting requirements. University of Suffolk 360 - School of Law and Social Sciences from University of Suffolk on Vimeo. To download the app, go to the Apple App Store or Google Play Store on your mobile device and search ‘University of Suffolk 360’. Further information about the University's relationship with the Health and Care Professions Council (HCPC) is available in the PSRB register. Full downloadable information regarding all University of Suffolk courses, including Key Facts, Course Aims, Course Structure and Assessment, is available in the Definitive Course Record. Social workers are typically employed by local authorities and other public organisations such as NHS trusts departments that provide services for children or adults. However, once you are qualified and registered, you can also work in the voluntary, private or independent social care sectors. For more information visit the British Association of Social Workers. Our course is developed to give you transferable skills, helping to broaden your career choices. Moving into social work is just one option – other opportunities range from Careers Adviser and Charity Project Officer to Play Therapist and Youth Worker. Whatever you aspire to do, we our best to help you explore your ambitions and potential pathways. Full-time tuition fee: £9,250 p.a. International tuition fee: £13,330 p.a. Detailed information about Tuition Fees. Find out more about Financial Support eligibility. Also see Loans and Grants. At University of Suffolk, your tuition fees provide access to all the usual teaching and learning facilities that you would expect. However, there may be additional costs associated with your course that you will need to budget for. See Course Costs. 120 UCAS tariff points (or above), BBB (A-Level), DDM (129) (BTEC), including A-level (or equivalent) subjects in Sociology, Law or Psychology based subjects are preferred. Or Access to HE Diploma - a minimum of 30 Level 3 credits at merit grade or above. Applicants are expected to hold GCSE English Language and Mathematics at grade 4/C or above. Level 2 equivalent qualifications in Maths and English will also be considered. Also see How to Apply. Satisfactory Enhances Disclosure and Barring Service (DBS) check. Applicants are required to provide additional disclosures concerning current and historical information around Safeguarding, any previous employment concerns or enquiries into standards of professional behaviour. This information is considered separate to the standard admissions process and is not discussed during the interview. All applicants must confirm prior to interview that they have the ability to use basic IT facilities, including word processing, internet browsing and the use of e-mail, and may be asked to specify how these skills have been obtained. Direct practical experience in a social work, social care or other relevant statutory or voluntary setting will be a distinct advantage at selection stage. Written response to a case study provided on the day. Prospective candidates will be provided with a comprehensive preparatory information pack prior to interview. IELTS 7.0 overall is required where English is not the students' first language. Also see International and EU. If you have previously studied at higher education level before you may be able to transfer credits to a related course at the University of Suffolk and reduce the period of study time necessary to achieve your degree. Your studies will be based mainly in the Waterfront Building located in the heart of the bustling Ipswich Waterfront. The building has six floors, one auditorium which seats 200 people, two main lecture theatres each seating 140 people and 34 teaching rooms seating between 18 and 80 people. The Waterfront Building supports flexible learning with open study on all floors, where we have approximately 50 iMacs for students to access. Our Waterfront Building provides a contemporary, comfortable and well-equipped base for your degree. Take advantage of our regular talks and guest speakers. 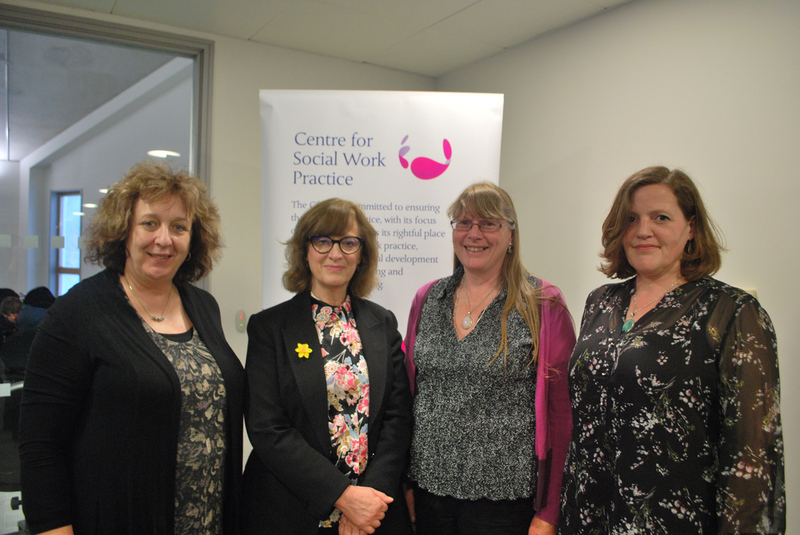 We recently held our fifth annual conference, ‘Conversations Across Difference’ – which looked at promoting inclusion by improving conversations across difference within the practice educator/student relationship and between the student and service user in the practice context. Our keynote speaker was Dr Prospera Tedam, who developed the MANDELA model of practice learning - a framework which encourages the development of positive relationships between social work students and their practice educators in both adult and children’s services.